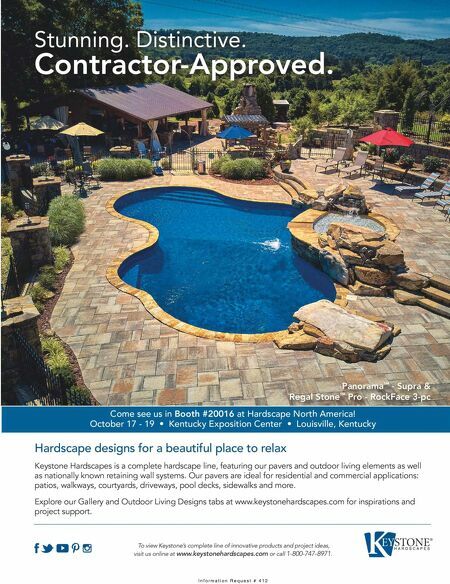 16 LCDBM Hardscapes continued from page 14 new polymer sand installed to allow for the two patios to age synchronously. Another challenge was how to create a water feature in a small space that did not overwhelm the space, but still provided the relaxing sounds of running water. To do that, they chose to install a bub - bling boulder water feature in the plant- ing bed above the one-foot-tall section of retaining wall. Existing perennials were removed, and a hole was excavated for the basin. The bottom was lined with 60Mill pond liner. A medium-sized AquaBasin was in- stalled. Four boulders were placed on the uphill side to retain the slope. And a trench was made for the 2" conduit from the boul- der. Then the crew installed sweep on each end for pump cord to be fed through. A simple lighting setup consisted of four deck post lights on the retaining wall, three dome path lights along the steps and a 120W transformer on the deck post near an electrical receptacle. All-in-all it took 2-men crews eight days to complete. There were no subcontractors used, and no real surprises as the project consisted of elements that TDH is very fa - miliar with building. When asked what advice he might give contractors who would attempt a project like this for the first time, Hartwyk replied, "Know your elevations. Doing a thorough elevation study will ensure that the project is being built in a location that makes it both feasible and affordable." LC DBM Left The retaining wall is dry stacked Pennsylvania fieldstone. In total it is over 25 linear feet: the 15' length in the middle is 24" in height, the 4.5' length in the middle near the driveway is 12" in height. There is also a 6' length near boulder steps that is 12' in height. At the client's request, a 9"x 9" stone, stamped with the logo of an architectural salvage company (inset), was incorporated at the end of the 24"-tall section. A multi stemmed Eastern redbud was planted in the garden adja - cent to the retaining wall. Right For the dry-set flagstone patio, which was approximate- ly 157 square feet, an addition- al 14" of CR6 aggregate was needed to level the base on the downhill side. The outer edge has about 25 linear feet of the stone, which was saw cut. 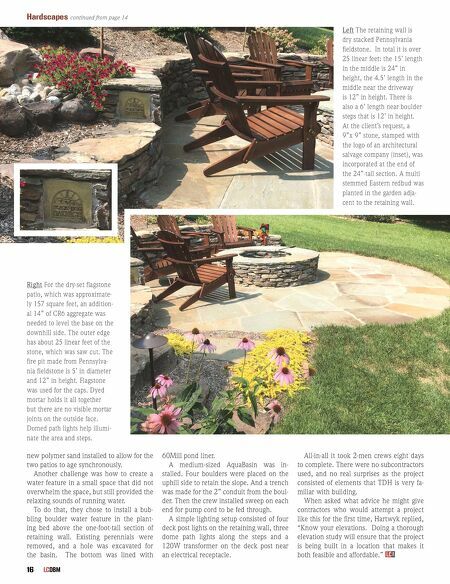 The fire pit made from Pennsylva - nia fieldstone is 5' in diameter and 12" in height. Flagstone was used for the caps. Dyed mortar holds it all together but there are no visible mortar joints on the outside face. Domed path lights help illumi - nate the area and steps.